Soft Pretzel Bites + Hatchery Review & Giveaway! the perfect treat for kids and adults of all ages! I'm a snacker. Late afternoon and early evening are my favorite times to snack. Hummus and pita bread and chips and salsa are my favorite go-to afternoon snacks, and popcorn is my favorite evening snack. I have popcorn almost every single night. It's a problem. An addiction really. I just love, love, love that stuff. But my afternoon snacks change from time to time and sometimes I crave something different. I love salty snacks, like pretzels. Especially soft pretzels. 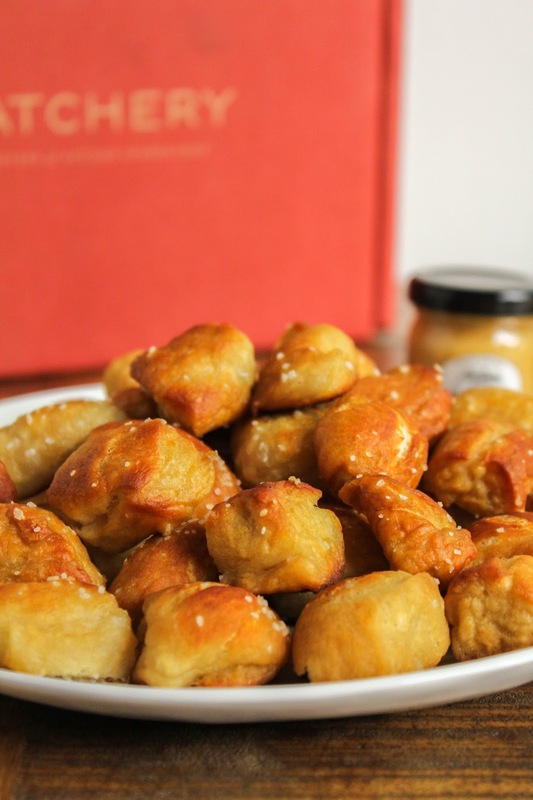 And I was recently inspired to make my own homemade soft pretzel bites. Let me give you a little backstory as to how this came about. I was recently sent a Hatchery Tasting Box to enjoy and review a few weeks ago. 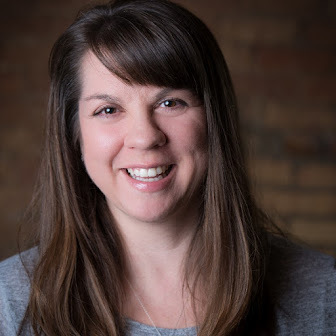 Have you heard of Hatchery? No? Well, let me tell you all about them! 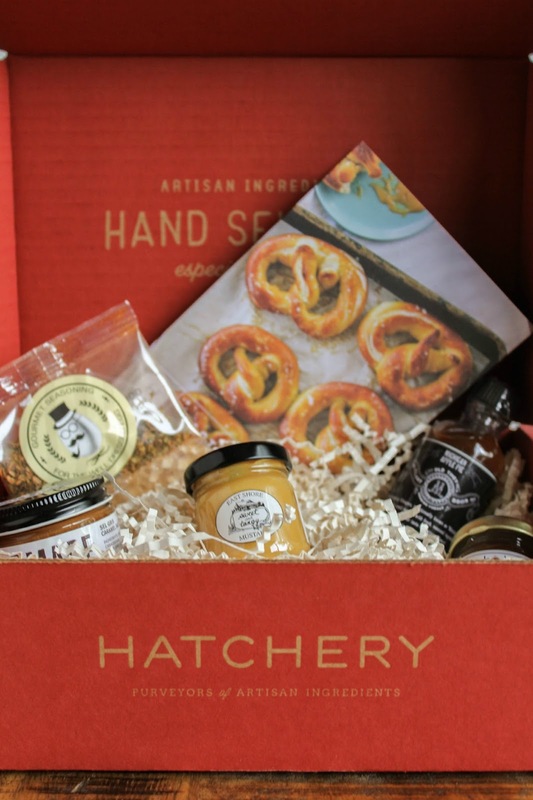 Hatchery focuses on small-batch, artisan products and delivers sample-size ingredients and condiments from their Marketplace each month to their customers. 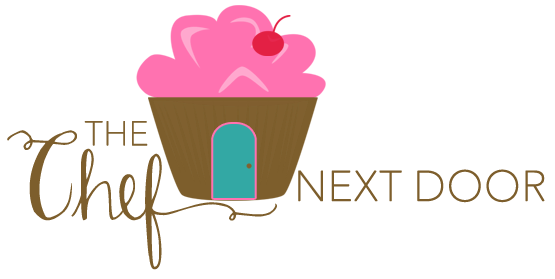 Each delivery includes items such as jams, honeys, syrups, spreads, cooking sauces, oils, vinegars, salts, spices, seasonings and much more. They also send along a Tasting Guide that includes info about each product, a short bio about the artisan maker, and suggested recipes and pairings. 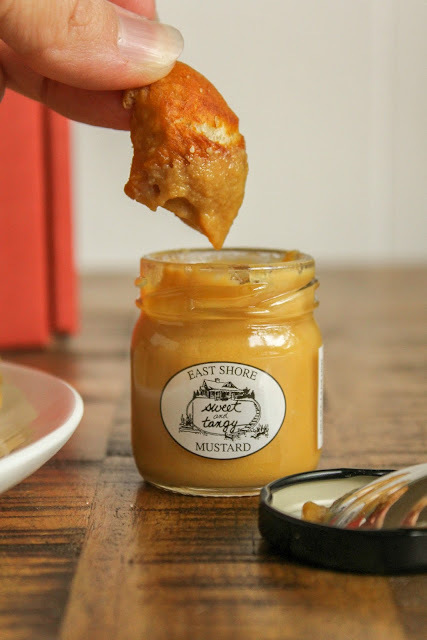 In my tasting box I received Sel Gris Caramel Sauce by CC Made; Sweet & Tangy Mustard by East Shore Specialty Foods; Michigan Apple Pie Drinking Vinegar by McClary Bros.; Apricot Fruit Spread by Just Jan's; and Gracefully Greek Gourmet Seasoning by Gourmegg. I've been having so much fun tasting and trying out each and every one of these little samples! From enjoying the apricot spread on my toast, to topping my ice cream with the caramel sauce, and even mixing a cocktail with the apple pie drinking vinegar, everything has been absolutely delicious. Which brings me to my original discussion about snacking and pretzels! That little jar of sweet and tangy mustard caught my eye and I just knew that warm, homemade pretzels would be perfect treat for dipping. Now this recipe may look long and complicated but let me assure you, it's not. It's a little time consuming, but not hard at all. There are just a few steps in the process and if you take you're time, everything will be just fine. What I love about these delicious bites is they don't have to be perfect. Mine all didn't end up being the same size or shape. Some were bigger than others, and some were a little flat. But oh well, that's the best part of making something homemade. It's made from the heart. And I love the little imperfections. I've got a surprise for you, too. 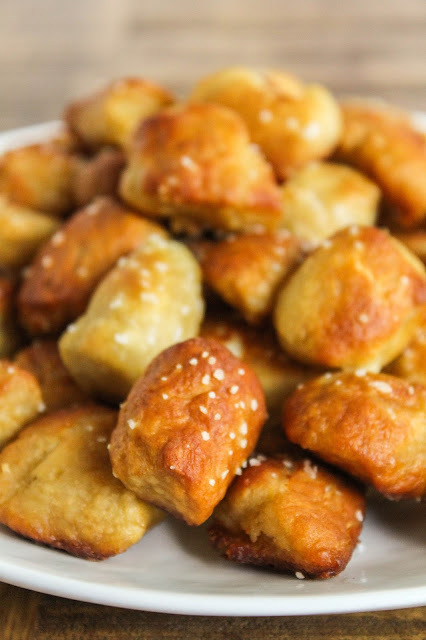 I mean, I know you can't wait to get your hands on the recipe for these delicious soft pretzel bites! 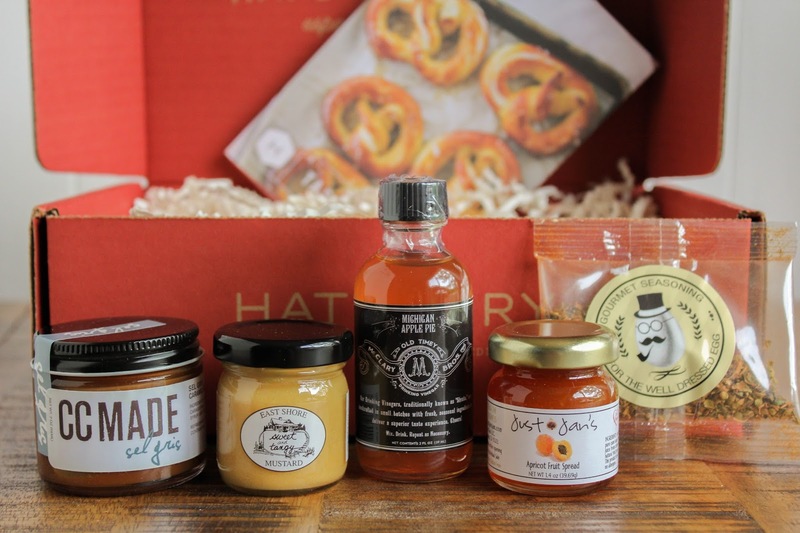 But in addition to that, the amazing folks at Hatchery are also offering one of my readers their very own Tasting Box! That's right, one person here will win a freshly curated Hatchery Tasting Box of their very own. Be sure to scroll down to the bottom of this post and fill out the form to enter to win. Good luck everyone! And happy eating! Stir together warm water and yeast in a large bowl and let stand until it becomes foamy, which will take about 10 minutes. Meanwhile, in a smaller bowl, whisk together the three cups of flour, salt, and brown sugar. Add the flour mixture and butter to the yeast mixture and stir together first with a wooden spoon and then with your hands, until it forms a dough. On a lightly floured surface, knead the dough until it is smooth and elastic, about 8 minutes or so, dusting with more flour as needed. Transfer the dough to a lightly oiled bowl and turn it over to coat with oil completely. Cover with a kitchen towel and let it rise in a draft-free place at room temperature until doubled, 2 to 3 hours. Punch down the dough and divide it into quarters. Form each quarter into 4 balls, then roll each ball into a 12-inch-long rope. Cut each rope into six pieces. Heat the oven to 450 degrees with the racks in the upper and lower third of the oven. Generously grease two large baking sheets. In a 4-quart saucepan or larger, bring the water and baking soda to a boil. Add 12 pretzel bites to the water at a time and cook for 30 seconds (they will rise to the surface almost immediately), then transfer with a slotted spoon or a spider to the baking sheets. Quickly sprinkle both sides of the pretzel bites with the coarse salt before they dry so that the salt sticks. Repeat with all of the remaining pretzel bites, returning the water to a boil between batches. Once all of the bites have been boiled, bake them in the oven, switching the sheets between racks and rotating sheets halfway through baking, until deep brown, 8 to 10 minutes. Immediately transfer them to wire racks to cool. Serve with Sweet & Tangy Mustard or your favorite favorite sauce for dipping. I received a Hatchery Tasting Box to enjoy and review at no charge, however, all opinions are my own. Thank you to Hatchery for sponsoring this giveaway as well!